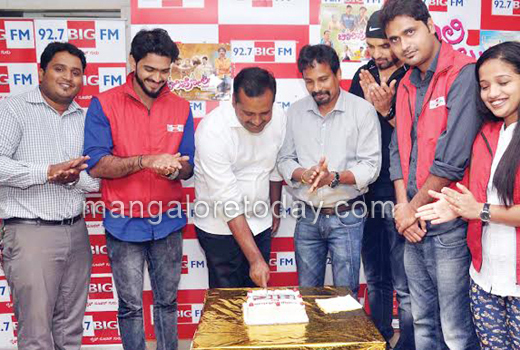 Mangaluru, May 19, 2015: A ceremony was held at the 92.2 Big FM office premises here on May 19, Tuesday to mark the completion of successful 200 days of screening of Tulu comedy ‘Chaali Polilu’ brought out under the banner of Jayakirana Films. State Minister for Health and Family Welfare UT Khader participated in the celebrations by cutting a cake. In his address, he said ‘Chaali Polilu’ has created a record by completing 200 days of screening. It is a good sign to note that even non-Tuluvas enjoy watching Tulu films. This will help in popularizing Tulu films across the globe, he added. Film Director Veerendra Shetty Kavoor thanked people of the district for patronizing the film in a big way. Producer Prakash Pandeshwar said the film would be released in Prabhath Theatre on May 22 and at Bahrain on May 27. Big FM staff Shilpa, Kiran, Rajesh and Joel were present among others.